Bortles finalized a one-year, $1 million contract with the Rams on Wednesday, Ian Rapoport of NFL Network reports. The Rams and Bortles are close to an agreement on a one-year contract, Jeff Darlington of ESPN reports. Analysis: With legitimate starting quarterback gigs few and far between throughout the league, Bortles will land one of the top available backup jobs. Working with coach Sean McVay and behind Jared Goff could do wonders for the five-year pro, who owns a 103:75 TD:INT in 75 career appearances. Bortles is set to visit with the Rams on Monday, Michael Silver of Sports Illustrated reports. 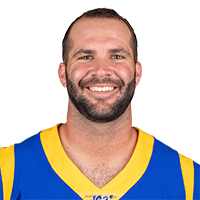 Analysis: This likely begins the transition for Bortles from a starter to a backup role since Jared Goff will continue to lead to Rams for the foreseeable future. Although Bortles struggled as a starter with Jacksonville, he'd be a quality backup, as he completed 60 percent of his passes for 2,718 yards, 13 touchdowns and 11 interceptions in 2018. The Jaguars released Bortles on Wednesday, Daniel Popper of The Athletic reports. 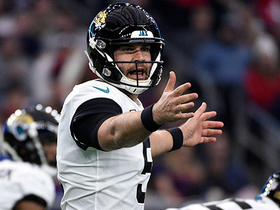 The Jaguars are expected to release Bortles despite owing him $6.5 million in guaranteed 2019 base salary, ESPN.com's Dan Graziano reports. General manager Dave Caldwell said Bortles is still in the mix at quarterback for the Jaguars, Zack Rosenblatt of The Newark Star-Ledger reports. Bortles completed 15 of 28 passes for 107 yards and an interception and added 15 yards on seven carries during Sunday's 20-3 loss to Houston. Analysis: If this was Bortles' last start for Jacksonville, he certainly made it easy for fans to let him go. The fifth-year passer meandered for most of the game before launching an ugly desperation pick into the end zone in the game's closing minutes with the Jaguars down by three scores. Bortles hasn't topped 130 passing yards in a game since Week 10 and has spent about half of that time benched. He might not get the opportunity to throw a pass for the Jaguars again. Bortles will start Sunday's game against the Texans. Multiple Jaguars players suggested Wednesday that Bortles would serve as the team's starting quarterback this weekend in the season finale against the Texans, Mark Long of the Associated Press reports. Bortles completed five of six passes for 39 yards during Sunday's 17-7 win over the Dolphins. He also rushed four times for 25 yards. Coach Doug Marrone announced Monday that Bortles will serve as the backup to Cody Kessler for the Jaguars' Week 13 game against the Colts, Field Yates of ESPN reports. Bortles completed 12 of 23 passes for 127 yards, one touchdown and two interceptions during Sunday's 24-21 loss to Buffalo. He added 39 yards on six carries. Bortles will get the start Week 12 in Buffalo, Michael DiRocco of ESPN.com reports. Bortles completed 10 of 18 passes for 104 yards while rushing twice for 17 yards and losing one of two fumbles in Sunday's 20-16 loss to the Steelers. Analysis: Bortles wasn't asked to do much, as Jacksonville built up a 16-0 lead on the back of three field goals and a Leonard Fournette rushing score. While Pittsburgh's offense came alive late, the Jaguars' offensive unit stalled, leading to a 20-0 Steelers run in the final 17 minutes. Bortles has been held to 155 or fewer passing yards four times this season while also exceeding 375 on three other occasions, so he'll have a low floor and high ceiling against the Bills in Week 12. Bortles completed 26 of 38 pass attempts for 320 yards and two touchdowns during Sunday's 29-26 loss to the Colts. Bortles (shoulder) was a full participant at Wednesday's practice. Bortles (shoulder) went through every drill during the open portion of Monday's practice, Michael DiRocco of ESPN.com reports. Analysis: Bortles injured his non-throwing shoulder prior to a Week 9 bye, likely giving him enough time to recover for Sunday's game at Indianapolis. The bigger concern is the possibility he could lose his starting job if he doesn't improve his play during the second half of the season. Bortles did have a solid outing during a Week 8 loss to the Eagles in London, but it wasn't enough to prevent the Jaguars from dropping to 3-5 with a fourth straight loss. 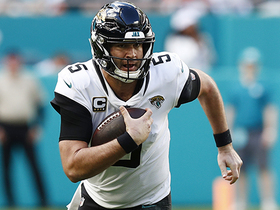 Bortles suffered an injury to his left shoulder in Sunday's 24-18 loss to the Eagles in London, but the quarterback is expected to be available for the Jaguars' next game Nov. 11 against the Colts, Tom Pelissero of NFL.com reports. Bortles completed 24 of 41 passes for 286 yards and a touchdown while adding 43 yards on eight carries in Sunday's 24-18 loss to the Eagles in London. Analysis: Bortles managed a turnover-free performance after getting benched last week, but his 7.0 yards per attempt were nothing to write home about and he failed to lead his team into the end zone outside of an 11-yard touchdown pass to Dede Westbrook. While 18 points is an acceptable output, that total was bolstered by a pair of Josh Lambo field goals from 50-plus yards. Bortles brings a 10:8 touchdown to interception ratio into Jacksonville's Week 9 bye. Bortles will retain the starting job for a Week 8 game against the Eagles in London, Michael DiRocco of ESPN.com reports. 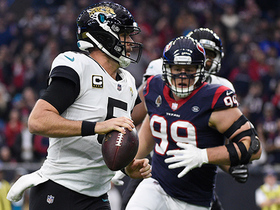 Analysis: Bortles was benched at halftime of Sunday's 20-7 loss to Houston, with Cody Kessler handling the final two quarters and producing just 5.2 yards per pass attempt. Faced with a pair of uninspired options, coach Doug Marrone seemed to drop a hint that a change was coming, but he ultimately decided to stick with his long-time starter. The situation could come under review again during the Jaguars' bye week if Bortles struggles in London. Coach Doug Marrone said he won't reveal his decision between Bortles or Cody Kessler for the starting quarterback job until he's discussed the matter with his players, John Oehser of the Jaguars' official site reports. Bortles was benched during Sunday's loss to the Texans and coach Doug Marrone said after the game, "It's open," when asked about the quarterback situation, Philip Heilman of The Florida Times-Union reports. Bortles was replaced in the third quarter of Sunday's game against the Texans by Cody Kessler. Analysis: The Jaguars were down at that point by a 20-0 mark, with Bortles having completed six of his 12 pass attempts for 61 yards, while adding six carries for 30 yards. Bortles completed 15 of 26 pass attempts for 149 yards, one touchdown and interception during Sunday's 40-7 loss to the Cowboys. He also rushed four times for 22 yards. Bortles completed 33 of 61 passes for 430 yards, a touchdown and four interceptions during Sunday's 30-14 loss to the Chiefs. He added a touchdown and 34 yards on four carries but also fumbled. Bortles completed 29 of 38 passes for 388 yards, two touchdowns and an interception while adding 28 yards on three carries in Sunday's 31-12 win over the Jets. Analysis: Bortles threw the only first-half touchdown for either team 1:47 before halftime, hitting running back T.J. Yeldon for a 31-yarder. He gave the Jets some life with a third-quarter interception but made up for that error with a 67-yard touchdown pass to Donte Moncrief on the next possession. Given Bortles' week-to-week inconsistency, it's anybody's guess what we'll see from him against a vulnerable Chiefs secondary in Week 5. Bortles completed 21 of 34 passes for 155 yards and rushed for 27 yards on five carries in Sunday's 9-6 loss to the Titans. 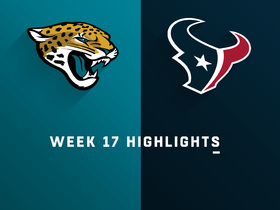 Analysis: Those hoping for a repeat of last week's offensive explosion were left bitterly disappointed in the first half, as Bortles threw for just 69 yards on 18 passing attempts. Things didn't get much better after the break, with Bortles delivering a painful reminder of just how maddeningly inconsistent he can be. He'll look to bounce back next week when Jacksonville plays a third consecutive home game with the Jets in town. Bortles completed 29 of 45 passes for 377 yards, four touchdowns and an interception while scrambling six times for another 35 yards in Sunday's 31-20 win over the Patriots. Analysis: It's going to be hard to beat this team if Bortles plays like this consistently. He threw touchdowns to four different receivers, including a 61-yard score to Dede Westrbook which sealed the victory in the fourth quarter. It's hard to believe this is the same guy that failed to break 200 yards against the Giants in Week 1. Bortles has also been quietly effective with his legs in the early going, accruing 77 rushing yards through two weeks. Bortles completed 18 of 33 passes for 176 yards, a touchdown and an interception in Sunday's season-opening, 20-15 win over the Giants. He also rushed four times for 42 yards. Analysis: Bortles wasn't asked to do too much, with Jacksonville's defense holding the Giants at bay while also scoring on a pick-six. His two biggest highlights were a one-yard touchdown pass to T.J. Yeldon and a 41-yard scramble. Workhorse running back Leonard Fournette went down with a hamstring injury in this one, so more could be asked of Bortles and the passing attack in the coming weeks if Fournette's forced to miss additional time. Bortles completed 17 of 23 passes for 204 yards and two interceptions during Saturday's preseason game against the Falcons. Bortles could see action for "a half (and maybe a little more)" in Saturday's preseason game against the Falcons, Phillip Heilman of The Florida Times-Union reports. Bortles will see increased playing time in Saturday's preseason game at Minnesota, FirstCoastNews.com reports. Bortles is facing no limitations after offseason wrist surgery and is illustrating increased accuracy thus far at Jacksonville's training camp, Michael DiRocco of ESPN.com reports. Jaguars coach Doug Marrone said Bortles (wrist) is pain-free and shouldn't have any limitations when he reports to the team in April, Ryan O'Halloran of The Florida Times-Union reports. Analysis: Bortles had surgery on his right wrist Jan. 26 and signed a three-year, $54 million extension less than a month later. He's been working out in California, preparing for the start of Jacksonville's offseason program in mid-April. In addition to the contract extension, the Jaguars have displayed confidence in their starter by opting not to bring in any veteran competition in free agency. The team does need to find a new backup, as Chad Henne signed with the Chiefs. Bortles (wrist), who agreed to a three-year, $54 million contract extension with the Jaguars on Saturday, said he expects to receive full clearance for full activities by early March, Michael DiRocco of ESPN.com reports. The Jaguars signed Bortles (wrist) to a two-year contact extension Saturday, The Florida Times-Union reports. Analysis: Bortles was slated to earn $19 million in 2018 after the Jaguars picked up the fifth-year option of his rookie contract, but the team opted to lock him up through 2020 with a new three-year deal worth $54 million, with $26.5 million guaranteed according to Adam Schefter of ESPN. The 25-year-old was expected to remain in Jacksonville and the new deal confirms it, but the guaranteed money does limit the team's long-term commitment. Bortles, who underwent surgery on his right wrist last Friday, is expected to be the Jaguars' starting quarterback in 2018, Ian Rapoport of NFL Network reports. "To my understanding, Blake Bortles is their quarterback, so no, [the procedure] shouldn't affect him at all [next season]," Rapoport said. Bortles, who underwent surgery on his right wrist last week, may not be fully healthy by the time the new league year opens March 14, which would prevent the Jaguars from cutting him, Cole Pepper of News4Jax.com reports. Bortles underwent surgery on his right wrist Friday, Adam Schefter of ESPN reports. Analysis: The specifics of Bortles' injury remain unclear, but Schefter indicates it's an issue the Jaguars' quarterback has battled since December 2016. If that is indeed the case, the 25-year-old played the entirety of the 2017 season with the injury and still managed to put together a solid season, committing the fewest turnovers of his career and playing well through the playoffs. Bortles completed 23 of 36 passes for 293 yards and a touchdown during Sunday's 24-20 loss to New England. Bortles completed 14 of 26 passes for 214 yards with one touchdown and no interceptions in Sunday's 45-42 AFC divisional-round win over the Steelers. He also gained 35 yards in five rushes and fumbled once but recovered. Bortles completed 12 of 23 passes for 87 yards with one touchdown and no interceptions in Sunday's 10-3 AFC wild-card win over the Bills. He also rushed 10 times for 88 yards and fumbled twice, recovering one. Bortles completed 15 of 34 passes for 158 yards with no touchdowns and two interceptions in Sunday's 15-10 loss to the Titans. 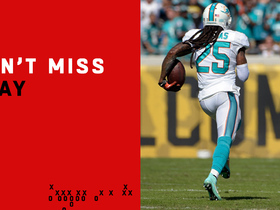 He also gained nine yards on his sole rush. Jaguars head coach Doug Maronne said he plans to play Bortles and the rest of the starters in Sunday's game against the Titans, John Oehser of Jaguars.com reports. "I want to see a lot of things," Marrone said. "I want to see how we respond to last week. I want to see how we respond from the second week of the season. I want to see where we're going. Analysis: The Jaguars hope to enter the postseason with momentum after losing to the 49ers last week, and Marrone may also be hesitant to essentially hand a playoff spot to a division opponent. While there's no guarantee he plays the entire game, Bortles is on track to get the Week 17 start, even though there's nothing he can do to move the Jags higher or lower than the No. 3 seed in the AFC. Chad Henne will finish out the game if Bortles is pulled at any point. Bortles completed 32-of-50 passes for 382 yards, two touchdowns, and three interceptions against the 49ers on Sunday. He added 31 yards rushing on five carries. Analysis: Bortles wasn't as clean as he had been in his spree of big games prior to Sunday, but his output against the 49ers still did the trick for his fantasy owners. He gets yet another favorable draw against the Titans in Week 17, so Bortles may be able to take some decent momentum into the playoffs. Bortles completed 21 of 29 pass attempts for 326 yards and three touchdowns during Sunday's 45-7 win over the Texans. Bortles completed 18 of 27 passes for 268 yards with two touchdowns and no interceptions in Sunday's 30-24 win over the Seahawks. He also lost two yards on seven rushes. Bortles completed 26 of 35 passes for 309 yards and two touchdowns while rushing three times for 27 yards in Sunday's 30-10 win over the Colts. Analysis: Bortles was tremendous in the first half, completing 14 of 20 passes for 157 yards and two touchdowns. He completed a two-point conversion to tight end Marcedes Lewis after a Leonard Fournette rushing touchdown in the third quarter while continuing to move the offense effectively after halftime. Bortles has a respectable 14:8 touchdown-to-interception ratio, but this was only his second game this season with multiple touchdown passes. Bortles completed 19 of 33 passes for 160 yards and an interception, adding six carries for 62 yards and two touchdowns in Sunday's 27-24 loss to the Cardinals. Bortles completed 17 of 30 pass attempts for 154 yards and a touchdown during Sunday's 19-7 win over the Browns. He also gained four yards on four carries and lost a fumble. Bortles completed 28 of 51 passes for 273 yards with a touchdown and two interceptions while adding 34 yards on five carries in Sunday's 20-17 overtime win over the Chargers. Analysis: Bortles came in riding a season-best two-game streak without an interception, but he was picked off on two of his season-high 51 passing attempts. Both of Bortles' interceptions came with his team trailing by three points with under two minutes to play in regulation, but Los Angeles miraculously still managed to blow its late lead. This performance shows that the 2014 first-rounder can't be trusted to provide strong fantasy numbers even when his team chooses to lean on the passing game. Bortles completed 24 of 38 passes for 259 yards and a touchdown and added 20 rushing yards in Sunday's 23-7 win over the Bengals. Analysis: Bortles accounted for the Jaguars' lone offensive touchdown in the second quarter on Sunday when he found Marquise Lee on the quick slant for a three-yard score. The 38 passing attempts were a season high for Bortles, with Leonard Fournette's benching undoubtedly playing a role in his elevated volume. Expect Fournette back next week and Bortles to consequently be thrust back into a caretaker role. Despite his solid play, he's thrown multiple touchdown passes just once this season. 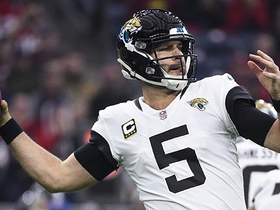 NFL Network's Tiffany Blackmon reports that Jacksonville Jaguars quarterback Blake Bortles will draw legitimate consideration from other teams once he is released. 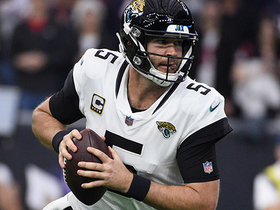 NFL Network Insider Ian Rapoport discusses how the Jacksonville Jaguars are expected to release quarterback Blake Bortles once Nick Foles' contract is official. 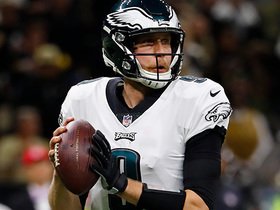 NFL Network's Tiffany Blackmon reports that the Jacksonville Jaguars have strong interest in quarterback Nick Foles. Houston Texans safety Andre Hal easily intercepts Jacksonville Jaguars quarterback Blake Bortles in the end zone. Jacksonville Jaguars quarterback Blake Bortles gets taken down for a loss of 8 yards. Miami Dolphins safety Louis Delmas intercepts Jacksonville Jaguars quarterback Blake Bortles' pass and returns it for a touchdown to put the Dolphins on the board. 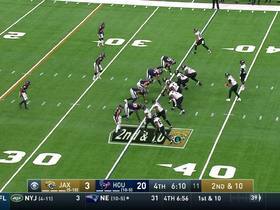 Jacksonville Jaguars quarterback Blake Bortles rushes for 13 yards. 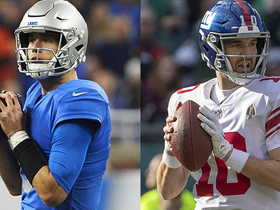 NFL Network's Deion Sanders explores which quarterbacks could be playing for different teams in 2019.